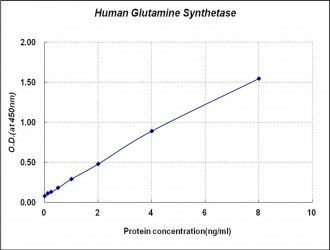 Glutamine Synthetase(GS) catalyzes the conversion of ammonia and glutamate to glutamine. 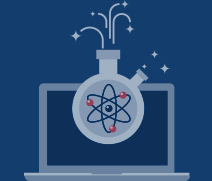 This reaction consumes a molecule of ATP : Glutamate + NH4+ + ATP Glutamine + ADP + Pi GS is found in astrocytes as an octamer of identical 45kDa subunits. Most well known function of GS is the detoxification of brain ammonia. It also has an important role in controlling metabolic regulations of neurotransmitter glutamate. Because of the multiple functions and importance of GS in cellular metabolism, both catalytic activities and synthesis are highly regulated. The activity of GS is controlled by adenylylation. Its activity is decreased in the cerebral cortex of brains affected by Alzheimer’s disease, particularly in the vicinity of senile plaques. It is also decreased under conditions of glucose deprivation. On the other hands, the level of expression of GS is increased during ischemia in vivo or hypoxia in culture.